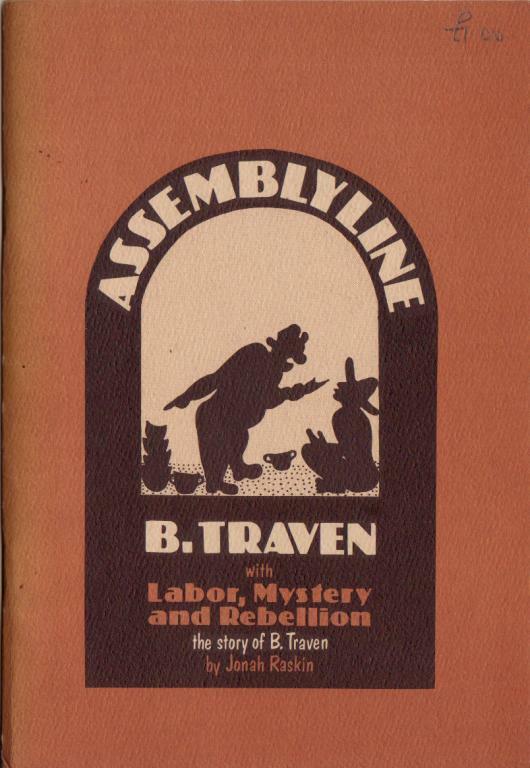 This is an early Traven story, taken, in an uncredited translation, (probably by Traven himself - I have Anglicised the spelling) from The Night Visitor and other stories, Allison & Busby, 1983 - a volume long out of print. The original German version - Der Grossindustrielle - was first published by the Buchergilde Gutenburg in 1928, as part of the collection Der Busch. Mr E.L.Winthrop of New York was on vacation in the Republic of Mexico. It wasn't long before he realised that this strange and really wild country had not yet been fully explored by Rotarians and Lions, who are forever conscious of their glorious mission on earth. Therefore he considered it his duty as a good American citizen to play his part in correcting this oversight. Walking along the dusty main street of this pueblocito, which knew nothing a pavements, drainage, plumbing, or of any means of artificial light save candles or pine splinters, he met with an Indian squatting on the earthen-floor front porch of a palm hut, a so-called jacalito. The Indian was busy making little baskets from bast and from all kinds of fibres gathered by him in the immense tropical bush which surrounded the village on all sides. The material used had not only been well prepared for its purpose but was also richly coloured with dyes that the basket-maker himself extracted from various native plants, barks, roots and from certain insects by a process known only to him and the members of his family. In spite of being by profession just a plain peasant, it was clearly seen from the small baskets he made that at heart he was an artist, a true and accomplished artist. Each basket looked as if covered all over with the most beautiful sometimes fantastic ornaments, flowers, butterflies, birds, squirrels, antelopes, tigers and a score of other animals of the wilds. Yet, the most amazing thing was that these decorations, all of them symphonies of colour, were not painted on the baskets but were instead actually part of the baskets themselves. Bast and fibres dyed in dozens of different colours were so cleverly - one must actually say intrinsically - interwoven that those attractive designs appeared on the inner part of the basket as well as on the outside. Not by painting but by weaving were those highly artistic designs achieved. This performance he accomplished without ever looking at any sketch or pattern. While working on a basket these designs came to light as if by magic, and as long as a basket was not entirely finished one could not perceive what in this case or that the decoration would be like. People in the market town who bought these baskets would use them for sewing baskets, or to decorate tables with or window sills or to hold little things to keep them from lying around. Women put their jewellery in them or flowers or little dolls. There were in fact a hundred and two ways they might serve certain purposes in a household or in a lady's own room. At the market he had to pay twenty centavos in taxes to sell his wares. Each basket cost him between twenty and thirty hours of constant work, not counting the time spent gathering bast and fibres,,preparing them, making dyes and colouring the bast. All this meant extra time and work. The price he asked for each basket was fifty centavos, the equivalent of about four cents. It seldom happened however that the buyer paid outright the full fifty centavos asked - or four reales as the Indians called that money. The prospective buyer started bargaining, telling the Indian that he ought to be ashamed to ask such a sinful price. "Why the whole dirty thing is nothing but dirty petate straw which you find in heaps wherever you may look for it; the jungle is packed full of it," the buyer would argue. "such a little basket, what's it good for anyhow? If I paid you, you thief, ten centavitos for it you should be grateful for it and kiss my hand. Well it's your lucky day, I'll be generous this time, I'll pay you twenty, yet not one green centavo more. Take it or run along." So he sold finally for twenty-five centavos, but then the buyer would say, "Now, what do you think of that? I've got only twenty centavos change on me. What can we do about that? If you can change me a twenty peso bill, all right, you shall have your twenty-five fierros." Of course, the Indian could not change a twenty peso bill and so the basket went for twenty centavos. He had little if any knowledge of the outside world or he would have known that what happened to him was happening every hour of every day to every artist all over the world. That knowledge would have made him very proud, because he would have realised that he belonged to the little army which is the salt of the earth and which keeps culture, urbanity and beauty for their own sakes form passing away. He had expected to hear a price of three or even four pesos. The moment he realised that he had judged the value six times too high, he saw right away what great business possibilities this miserable Indian village might offer to a dynamic promoter like himself. Without further delay he started exploring those possibilities. "Suppose, my good friend, I buy ten of these little baskets of yours, which I might as well tell admit right here and now, have practically no real use whatsoever. Well, as I was saying, if I buy ten, how much would you then charge apiece?" The Indian hesitated for a few seconds as if making calculations. Finally he said, "If you buy ten I can let you have them for forty-five centavos each, se-orito gentleman." After three weeks' stay in the Republic, Mr Winthrop was convinced that he knew this country perfectly, that he had seen everything and knew all about the inhabitants, their character and their way of life, and that there was nothing left for him to explore. So he returned to good old Nooyorg and felt happy to be once more in a civilised country, as he expressed it to himself. One day going out for lunch he passed a confectioner's and, looking at the little display in the window, he suddenly remembered the little baskets he had bought in that faraway Indian village. He hurried home and took all the baskets he still had left to one of the best known candy-makers in the city. "I can offer you here," Mr Winthrop said to the confectioner, "one of the most artistic and at the same time the most original of boxes, if you wish to call them that. These little baskets would be just right for the most expensive chocolates meant for elegant and high priced gifts. Just have a good look at the sir, and let me listen." Next day when both gentlemen met again Mr Kemple said: "Now, to be frank with you, I know art on seeing it, no getting around that. And these baskets are little works of art, they surely are. However, we are not art dealers, you realise that of course. We've no other use for these pretty little things except as fancy packing for our French pralines made by us. We can't pay for them what we might pay considering them as pieces of art. After all to us they're only wrappings. Fine wrappings perhaps, but nevertheless wrappings. You'll see it our way, I hope, Mr - oh yes, Mr Winthrop. So, here is our offer, take it or leave it: a dollar and a quarter apiece and not a one cent more." The confectioner, misunderstanding this involutary gesture of Mr Winthrop, added quickly "All right, all right, no reason to get excited, no reason at all. Perhaps we can do a trifle better. Let's say one-fifty." The Indian rose, took off his hat, bowed politely and said in his soft voice, "Be welcome, patroncito. Thank you I feel fine, thank you. Muy buenas tardes. The house and all I have is at your kind disposal." He bowed once more, moved his right hand in a gesture of greeting and sat down again. But he excused himself for doing so by saying, "Perdonme, patroncito, I have to take advantage of the daylight, soon it will be night." "Good to hear that, se-or." "Of course, se-or. I can make five thousand if I can make one thousand." "Of course I can, se-or. I can make as many as you wish. You see I am an expert in this sort of work. No one else in the whole state can make them the way I do." "Thank you for the honour, patroncito." After a few minutes he said in a slow voice, "It will take a good long time to make so many baskets, patroncito. You see, the bast and the fibres must be very dry before they can be used properly. Then all during the time they are slowly drying they must be worked and handled in a very special way so that while drying they won't lose their softness and their flexibility and their natural brilliance. Even when dry they must look fresh. They must never lose their natural properties or they will look just as lifeless and dull as straw. Then while they are drying I got to get the plants and roots and barks and insects from which I brew the dyes. That takes much time also, believe me. The plants must be gathered when the moon is just right or they won't give the right colour. The insects I pick from the plants must also be gathered at the right time and under the right conditions or else they produce no rich colours and are just like dust. But of course, jefecito, I can make as many of these canastitas as you wish, even as many as three dozens if you want them. Only give me time." That figure was too high for the Indian to grasp. He became slightly confused and for the first time since Mr Winthrop had arrived he interrupted his work and tried to think it out. Several times he shook his head and looked vaguely around as if for help. Finally he said, "Excuse me, jefecito, little chief, that is by far too much for me to count. Tomorrow, if you will do me the honour, come and see me again and I think I shall have my answer ready for you, patroncito." "Si, patroncito, I have the price ready. You may believe me it has cost much labour and wrory to find out the exact price, because, you see, I do not wish to cheat you out of your honest money." "Yes, yes, I see that." Mr Winthrop felt as if he would go insane any minute now. "Yes, so you said. Only what I can't comprehend is why you cannot sell at the same price if you make me ten thousand. I certainly don't want to chisel on the price.I am not that kind. Only, well, let's see now if you can sell for forty centavos at all, be it for twenty or fifty or a hundred, I can't quite get the idea why the price has to jump that high if I buy more than a hundred." "Bueno, patroncito, what is there so difficult to understand? It's all very simple. One thousand canastitas cost me a hundred times more work than a dozen. Ten thousand cost me so much time and labour that I could never finish them, not even in a hundred years. For a thousand canastitas I need more bast than for a hundred, and I need more little red beetles and more plants and roots for the dyes. It isn't that you can just walk into the bush and pick all the things you need at your heart's desire. One root with the true violet blue may cost me four or five days until I can find one in the jungle. And have you thought how much time it takes and how much hard work to prepare the bast and fibres? What is more if I must make so many baskets, who will then look after my corn and my beans and my goats and chase for me occasionally a rabbit for meat on Sunday? If I have no corn then I have no tortillas to eat, and if I grow no beans , where do I get my frijoles from?" "That's what you think, se-orito, little lordy. But you see it is only the corn I grow for myself that I am sure of. Of the corn which others may or may not grow, I cannot be sure to feast upon." "Why then can't they cultivate your fields and look after your goats while you make baskets for me? Not only this, they might gather for you the fibres and the colours in the bush and lend you a hand here and there in preparing the material you need for the baskets." "They might, patroncito, yes, they might. Possible. But then you see who would take care of their fields and cattle if they work for me? And if they help me wit the baskets it turns out the same. No one would any longer work in his fields properly.In such a case corn and beans would get up so high in price that none of us could buy any and we would all starve to death. Besides, as the price of everything would rise and rise higher still how could I make baskets for forty centavos apiece? A pinch of salt or one green chilli would set me back more than I'd collect for one single basket. Now you'll understand, highly estimated caballero and jefecito, why I can't make the baskets any cheaper than fifteen pesos each if I got to make that many." Mr Winthrop was hard-boiled, no wonder considering the city he came from. He refused to give up more than fifteen thousand dollars which at that moment seemed to slip away through his fingers like nothing. Being really desperate now, he talked and bargained with the Indian for almost two full hours, trying to make him understand how rich he, the Indian, would become if he wolf take this greatest opportunity of his life. "You know my good man," Mr Winthrop said, "such a wonderful chance might never again knock on your door, do you realise that? Let me explain to you in ice-cold figures what fortune you might miss if you leave me flat on this deal." The American, noting this growing interest in the Indian, misjudged the real significance of it. "There you are, my friend," he said. "That's exactly how rich you are going to be. You'll have a bankroll of exactly four thousand pesos. And to show you that I'm a real friend of yours, Ill throw in a bonus. I'll make it a round five thousand pesos, and all in silver." The Indian however, had not for one monent thought of four thousand pesos. Such an amount of money had no meaning to him. He had been interested solely in Mr Winthrop's ability to write figures so rapidly. "Yes I know that, jefecito, my little chief," the Indian answered entirely uncomcerned. "It must be the same price because I cannot make any other one. Besides, se-or, there's still another thing which perhaps you don't know. You see my good lordy and cabalerro, I've to make these canastitas my own way and with my song i them and with bits of my soul woven into them. If I were to make them in great numbers there would be no longer my soul in each, or my songs. Each would like the other with no difference and such a thing would slowly eat up my heart. Each has to be another song which I hear in the morning when the sun rises and when the birds begin to chirp and the butterflies come and sit down on my baskets so that I may see a new beauty, because, you see, the butterflies like my baskets and the pretty colours on them, that' why they come and sit down, and I can make my canastitas after them. And now, se-or jefecito, if youwill kindly excuse me, I have wasted much time already, although it was a pleasure and a great onour to hear the talk of such a distinguished caballero like you. But I'm afriad I've to attend to my work now, for day after tomorrow is market day in town and I got to take my baskets there. Thank you, se-or, for your visit. Adios." And in this way it happened that American garbage cans escaped the fate of being turned into receptacles for empty, torn and crumpled little multicoloured canastitas into which an Indian of Mexico had woven dreams of his soul, throbs of his heart: his unsung poems. Anyway, the author completely misses the point: in order to deliver ten thousand baskets "by October", the artisan would have to produce three baskets an hour, which is unrealistic. Moreover, referring to the artisan as "the Indian" is racist. referring to the artisan as "the Indian" is racist. Why? "First published in 1928", I don't know what were considered acceptable terms by indigenous or other groups then, do you? One has to also take into account translation (the story was written in German originally) and that Traven was very sympathetic to this social group and their culture and crititicised their persecution. The term "the Indian" is not offensive by itself but in this context the nationality is not important at all and should not serve as a specific descriptor. Imagine someone from another culture describing an encounter with an American painter or architect in the USA and referring to the painter as "the American", in an environment where almost all people are Americans. The term "the Indian" is not offensive by itself but in this context the nationality is not important at all and should not serve as a specific descriptor. I believe the author was using "Indian" as an ethnic, rather than national, description - as part of a general theme in his writings of the exploitation of impoverished Indians within a Mexican society divided along intersecting ethnic, racial and class lines as a result of long colonialism, imperialism etc.. Similarly with your "American" example; if people are referred to as Native-American/First Nation, Afro-American, Irish-American etc is that racist? Eg, to write in a completely colour-blind way about the US southern states would generally be quite unrealistic. Or Zulu and British? Or are you referring to "Indian" as a distinct nationality within Mexican territory? Regardless, in a story set in, eg, 1920s Mississippi, would it be racist to describe a character as black or Afro-American? Similarly, in this story Traven is defining a particular ethnic group within the wider Mexican ethnic mix and commenting on power relations and culture clashes between different social groups. Imo he's using a theme that runs through much of his writing; the resistance of the traditional Indian culture of that time and place to being integrated into the encroaching modern market economy. He makes the two characters - the American businessman and the Indian peasant - embodiments of these two cultures and his sympathies are clearly with the Indian. So it seems very relevant to the story to use such a description. the author completely misses the point: in order to deliver ten thousand baskets "by October", the artisan would have to produce three baskets an hour, which is unrealistic. Part of the point of the story is the clash between the 'realism' of the capitalist and the very different realism of the peasant - the businessman seeks to introduce an imperialist capitalist realism and tries to encourage the Indian to start employing his village neighbours to meet the production needs of the international market.